First of all, let me apologize for not posting this past week. Life gets busy sometimes and I’m not always able to turn on the computer. We’ve had some potential bad news about our new sink. There was a mix up in the ordering process and we may have to wait another 8 weeks before it arrives. I am none too happy about this. Let me state that it was neither my fault nor Mr. Contractor’s fault. It was a communication lapse between the party we purchased from and the manufacturer/distributor. I’m being patient right now allowing it to get worked out – but if it doesn’t then someone is going to get a piece of my mind. Miriam thinks I’m blowing hot air, because I often do, but not this time. I want my sink dammit! 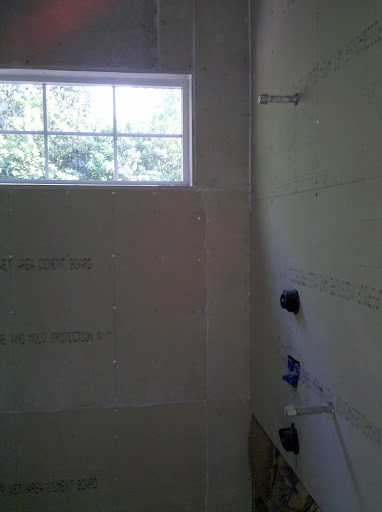 What you see above is the shower with the cement board installed. The floor has also been fitted with the board. Now, all we need is some tile put down and we’ll be rocking. 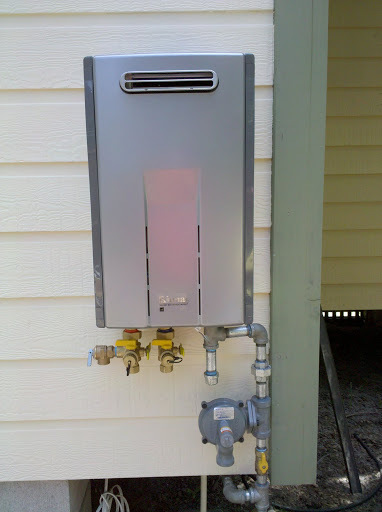 Our new tankless water heater pictured above has been installed – it’s not online yet but might be by the end of this week. Below is the original inside door to the bedroom. We’ve removed the casing and are going to use it for the new door that’s going into the hallway. 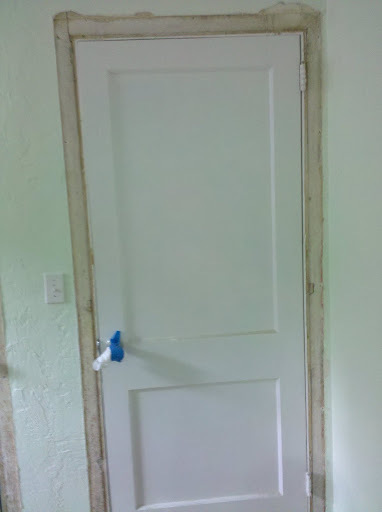 This existing door will be trimmed just like the other new doors in the room – consistency is the buzz word here. 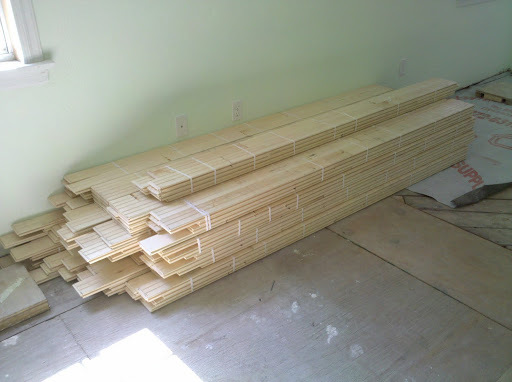 When, what to my wondering eyes should appear – but our new maple floor! What a lovely site. Should be installed next week! We’re getting a little bit closer every day. I thought the original sub floor was interesting. This is how they did it back in the day (early 1940’s). Well, that’s all for now, dear readers. It’s early evening, but I’m awful tired. Can’t be staying up past 11pm and get up at 6am – I’m too old for that. So, I think I’ll go take a nap. See you soon. 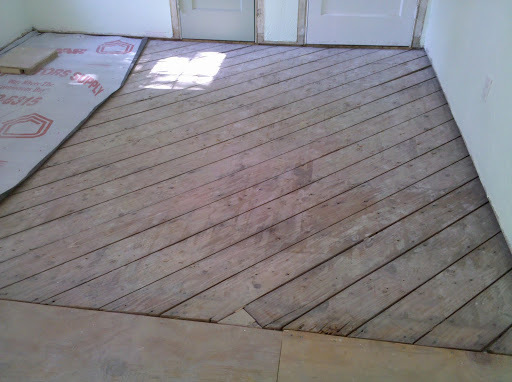 We have the exact same diagonally-laid subfloor in our house! Sorry about your sink. Our bathroom sink was stored in the back bedroom, in 2 boxes (one for the basin, one for the porcelain legs), for months before it was ever needed. The tub, toilet, gas range, and kitchen sink were all here long before needed, too. I think ordering the fixtures that you want yourself, and having it all on the job site before the work begins really is the way to go. Nevertheless, there are always those unavoidable delays, even with the best thought-out plans. In our case, we had a bum kitchen faucet. I had ordered it online, and it sat in its box for weeks prior to being installed, at which time we learned that it had a defective part. Now, this faucet was unusual in that it has an unusually long reach (12″ long spout), due to the size of our sink and the wall-mounted location of the faucet, so we couldn't just go to Home Depot and buy a replacement. Most kitchen faucets are under 10″ long. The entire faucet had to be uninstalled (we couldn't have water leaking everywhere, now could we? ), and the lead caps put back on the supply lines until our plumber was able to locate a replacement valve. Not a big deal, in retrospect, but at the time…. Yes, I know I should be very happy that this has been the only snag in the entire process so far. And, Mr. Contractor has said that the delay in getting the sink won't affect any of the work – we might just have to use the sink in the guest bathroom until it arrives. Maybe we'll get some better news this week. Then I see the pelicans in the gulf coated with oil and I realize that my problem is not one at all…so sad.